Outside of some early standouts in his career, Ridley Scott’s filmography never really inspired much confidence. He’s not a particularly interesting director outside of the science-fiction genre. My initial interest in Prometheus stemmed from this return to the familiar, which is odd, given that it almost comes across as a desperate attempt at returning to form. And while Prometheus has its share of disappointment, it still ought to be recalled with the same sort of adoration that’s ascribed to Scott’s Alien and Blade Runner. 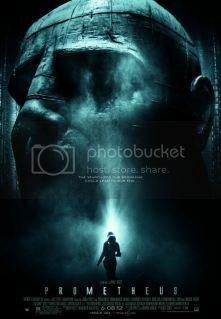 Prometheus’ success stems largely from its general premise and the talented cast that elevates serviceable material. The narrative that Scott attempts to illustrate is the conquest of knowledge, whereupon mankind uncovers the mystery of existence and its origins. It’s an admirable attempt to layer a narrative that has its share of issues, including thin characterization and clunky dialogue. The cast, primarily Michael Fassbender and Noomi Rapace, rise above the material’s faults largely because of the physicality that their roles demand. Dialogue-driven roles realized by Charlize Theron and Guy Pearce don’t fare as well. While both Fassbender and Rapace play roles that have essentially been recycled from other pictures (Steven Spielberg’s A.I Artificial Intelligence and Scott’s own Alien), they manage to instill a level of uniqueness into their characters – an impressive feat given that the material provides them with very little in the way of character development. Prometheus’ greatest asset rests in its sharp production design by Arthur Max. From the construction of the catacomb corridors of its space vessels to the detail in each perfectly tailored space suit, Max understands the scope of the material and astutely constructs a new planet out of a specific worldview. As a result, most of Prometheus evokes an awe-inspiring reaction, even as it gets diluted by its dialogue. As problematic as Prometheus can be, I couldn’t help but get enamored by the picture’s scope. Unlike most summer blockbusters, there’s a significant time invested to the awe of sights as opposed to inspiring awe through explosions and rapid-fire editing. Prometheus, on a technical level, at least has a basic grasp of elevating tension and evoking surprise through more physical and mental horrors. A particular sequence involving a self-imposed cesarean section promises the same sort of physical nightmares found in a David Cronenberg film. And given that David Cronenberg isn’t going to be having any wide release Hollywood blockbuster coming out soon, Prometheus will have to do.